The Travelers Companies, Inc., commonly known as Travelers, is an American insurance company. It is the second largest writer of U.S. commercial property casualty insurance and the third largest writer of U.S. personal insurance through independent agents. 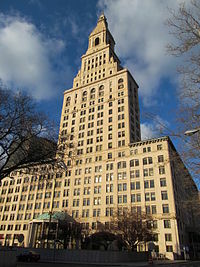 Travelers is incorporated in Minnesota, with headquarters in New York City and its largest office in Hartford, Connecticut. Travelers also maintains a large office in St. Paul, Minnesota. It has been a component of the Dow Jones Industrial Average since June 8, 2009. The company has field offices in every U.S. state, plus operations in the United Kingdom, Ireland, Singapore, China, Canada, and Brazil. Travelers ranked No. 106 in the 2018 Fortune 500 list of the largest United States corporations with total revenue of $28.9 billion. Saint Paul Fire and Marine Insurance Co. was founded March 5, 1853, in St. Paul, Minnesota, serving local customers who were having a difficult time getting claim payments in a timely manner from insurance companies on the east coast of the United States. It barely survived the Panic of 1857 by dramatically paring down its operations and later reorganizing itself into a stock company (as opposed to a mutual company). It soon spread its operations across the country. In 1998 it acquired USF&G, known formerly as United States Fidelity and Guaranty Company, an insurance company based in Baltimore, Maryland, for $3.9 billion in stock and assumed debt. By buying USF&G, they went from the 13th to the eighth largest property and casualty insurance company in the United States. Through economies of scale between the two companies, and a difficult business environment, they downsized the company substantially over the coming years by selling certain business units to focus on more profitable business units. Travelers was founded in 1864 in Hartford. It was founded to provide travel insurance to railroad travelers at a time when travel was far more risky and dangerous than today, hence the name. Along the way it had many industry firsts, including the first automobile policy, the first commercial airline policy, and the first policy for space travel. In 1954 it established the world's first privately owned weather research facility, the Travelers Weather Research Center, the first organization to make weather predictions using probabilities ("20% chance of rain"). By the early 1990s, Travelers was predominantly a general property and casualty insurer that also happened to do some travel insurance on the side, and it quietly exited its original business in 1994. What was left of Travelers' travel insurance business was acquired by three former employees and is now known as Travel Insured International, a Crum and Forster Company. In the 1990s, it went through a series of mergers and acquisitions. It was bought by Primerica in 1993, but the resulting company retained the Travelers name. In 1995 it became The Travelers Group. It bought Aetna's property and casualty business in 1996. In 1998, the Travelers Group merged with Citicorp to form Citigroup. However, the synergies between the banking and insurance arms of the company did not work as well as planned, so Citigroup spun off Travelers Property and Casualty into a subsidiary company in 2002, although it kept the red umbrella logo. Three years later, Citigroup sold Travelers Life & Annuity to MetLife. In 2003, Travelers bought renewal rights for Royal & SunAlliance Personal Insurance and Commercial businesses. In 2004, the St. Paul and Travelers Companies merged and renamed itself St. Paul Travelers, with the headquarters set in St. Paul, Minnesota. In August of that year, it was charged of misleading statements associated with the merger. Despite many assurances from CEO Jay Fishman that the newly formed company would retain the St. Paul name, the corporate name only lasted until 2007, when the company repurchased the rights to the famous red umbrella logo from Citigroup and readopted it as its main corporate symbol, while also changing the corporate name to The Travelers Companies. In November 2010, Travelers entered into a joint venture agreement under which the company would invest in J. Malucelli Participações em Seguros e Resseguros S.A., the market leader in the surety insurance business in Brazil. The transaction closed in June 2011 with Travelers acquiring a 43.4 percent interest. Travelers' investment in newly issued shares significantly increased J. Malucelli's capital level, positioning it for substantial growth in Brazil. At the time, Travelers had the option to increase its investment to retain a 49.5 percent interest, which the company later did in 2012. In June 2013, Travelers announced the acquisition of Dominion of Canada General Insurance Company from E-L Financial Corporation Limited (TSX: ELF). The transaction later closed in November 2013. The combined organization, referred to as Travelers Canada, remains headquartered in Toronto. The company's joint venture with J. Malucelli in Brazil completed the acquisition of a majority interest in Cardinal Compañía de Seguros, a Colombian start-up surety provider in September 2015. The business, which is based in Bogotá, operates under the co-branded name J. Malucelli Travelers. In October 2015, Travelers acquired a majority interest in the property casualty business of its J. Malucelli joint venture in Brazil. J. Malucelli commenced writing property casualty business in 2012. The property casualty business operates under the Travelers brand and focuses on property, general liability, construction and financial insurance products. The business is based in São Paulo. As a result of the transaction, Travelers now owns 95 percent of the property casualty business with Paraná Banco, the parent company of J. Malucelli, retaining a five percent interest. Travelers’ interest in the surety business of the J. Malucelli joint venture remains at 49.5 percent. In March 2017, Travelers agreed to acquire UK-based Simply Business from Aquiline Capital Partners for approximately $490 million. Simply Business is a leading U.K. distributor of small business insurance policies, offering products online on behalf of a broad panel of carriers. It has more than 425,000 microbusiness customers covering more than 1,000 classes of business, and was named “Best Company to Work For” by The Sunday Times in 2015 and 2016. The transaction adds to Travelers' digital capabilities. In 2018, Travelers ranked 106 on the Fortune 500 list of largest U.S. companies. On June 8, 2009, Travelers replaced its former parent Citigroup on the Dow Jones Industrial Average. On August 4, 2015, the company announced that Alan Schnitzer would succeed Jay Fishman as Chief Executive Officer effective December 1, 2015. On August 4, 2017, Travelers completed its previously announced acquisition of Simply Business, a leading provider of small business insurance policies in the United Kingdom. In January 2007, Travelers agreed to pay US$77 million to six states to settle a class action suit and end investigations into its insurance practices. The charges involved paying the insurance broker Marsh & McLennan Companies contingent commissions to win business without the knowledge of clients, thus creating a conflict of interest. Additionally, the investigation examined whether Travelers had created the illusion of competition by submitting fake bids, thus misleading clients into believing they were receiving competitive commercial premiums. In August 2012, Travelers sued the National Football League for forcing the company and its subsidiaries to pay to defend the league for failing to protect players from brain injury, in a case filed in the New York State Supreme Court called Discover Property & Casualty Co. et al. vs. National Football League et al., New York State Supreme Court, New York County, No. 652933/2012. The league had sued over three dozen insurance companies the week before in an attempt to cover the claims that players made against the league. In 2006, a Travelers commercial titled Snowball was nominated for an Emmy. Snowball featured a man, walking down a steep San Francisco sidewalk, who trips and knocks over a table of items at a garage sale. The man and the items roll down the street, forming a ball which gathers garbage cans, pedestrians, construction materials, motorcycles, light poles, and other items, in a manner very reminiscent of the familiar cartoon "snowball" effect or the cult video game Katamari Damacy. The creators of the ad say it is simply based on the snowball effect, they have never heard of the game, and that the resulting similarity was a surprise to them. In April 2008, The Travelers repurchased the rights to the famous red umbrella, which is featured in several commercials starring Paul Freeman as well as other advertisements. In July 2008, the spot "Delivery," also starring Freeman, was nominated for an Emmy. This page was last edited on 28 March 2019, at 05:14 (UTC).